Ford created history on the Cyprus Rally today by claiming its 50th consecutive points finish in the FIA World Rally Championship. Three Focus RS World Rally Cars finished in the top six places of the season's toughest rally to ensure Ford reached its half century. Since the championship was officially launched in 1973, there have been 411 world rallies and no other manufacturer has composed a run of consecutive points scores that exceeds 36. The record-breaking sequence, on surfaces as diverse as rough gravel, smooth asphalt and snow and ice, demanded a blend of strength, speed and reliability from the Focus. It began on the Monte Carlo Rally in 2002. Fifth place for BP-Ford World Rally Team drivers Toni Gardemeister and Jakke Honkanen and sixth for team-mates Roman Kresta and Jan Mo�nύ on the car-breaking gravel tracks of the Mediterranean island sealed the achievement. Ford's delight was complete when private entrants Henning Solberg and Cato Menkerud claimed fourth in another Focus RS. "This is a quite remarkable feat," said BP-Ford team director Malcolm Wilson, who has presided over the run. "No other manufacturer has come close to this record. It's a tribute to the nine drivers who have contributed to this run and the whole M-Sport team, which has worked so hard over the past seasons. But most of all, it's a success for the Ford Focus which has displayed its speed and strength throughout the 50 rallies. Now our sights are firmly set on extending the record even further." This sixth round of the championship was one of the toughest events seen in recent years. Incredibly rocky gravel tracks in the Troodos Mountains took a heavy toll and only 21 of the original 54 starters completed the gruelling three-day route which covered 326.68km of competition. Shade temperatures of 30°C and twisty roads, that ensured average speeds often failed to rise above 60kph, meant there was little airflow and conditions were tough for drivers and hard-working engines, transmissions and suspension. Gardemeister and Honkanen started today's final leg in fifth. With no pressure from behind the Finns took no risks but still posted two fastest times from the six speed tests to maintain their position. "The times might not suggest it, but I drove quite slowly today," said 30-year-old Gardemeister. "It's hard to find a good rhythm when the pace is not 100 per cent and you're driving at a speed so that you don't make a mistake. We weren't on full attack but couldn't drop our speed too much. But generally we've had a good pace and it's a pity we lost time with two punctures earlier in the event. "It's fantastic for Ford to set this points record and this was the toughest rally possible on which to do it. It's been hard on drivers and cars. It was incredibly hot and rough but I had confidence in the Focus. It felt strong and it's been nice to drive here," he added. Kresta and Mo�nύ were also in no mood to take risks. 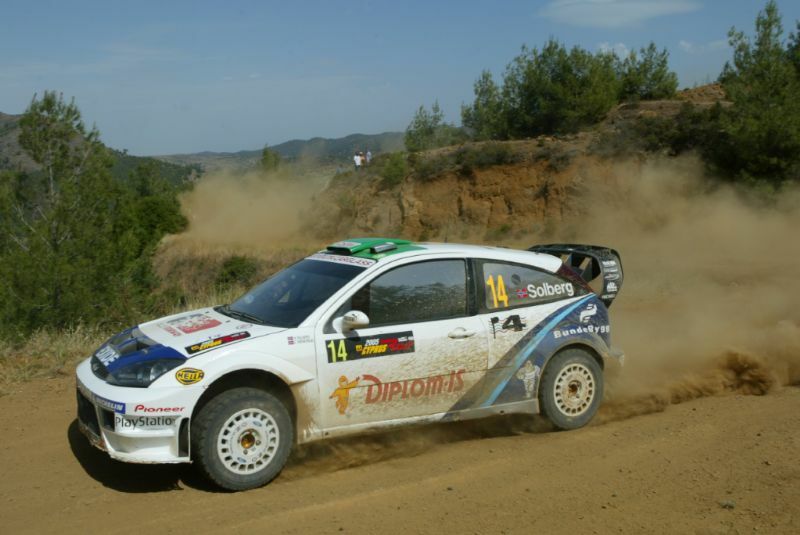 They retained sixth place throughout the final leg to match their career-best result, set on the previous round in Sardinia just two weeks ago. "This is the hardest rally I've ever driven, apart from the Safari Rally in Kenya which is unlike any other event," said the 29-year-old Czech driver. "It's been tough for co-drivers and drivers. It was hot in the car and the stages were long and difficult. I'm pleased that I was well prepared and fit. I'm not sure how I would have coped if I wasn't fit. We scored good points and this is a great achievement for everyone in Ford." Solberg and Menkerud started the day in third but came under pressure from Markko Mδrtin. When a faulty motor on their car's fly-by-wire throttle system caused the engine to stop twice in the third special stage, the 15 seconds lost looked like proving decisive. Although Solberg retaliated during the final loop of tests, he could not catch Mδrtin. However, fourth is a career-best result. "I tried so hard to regain the time," said Solberg. "We took a gamble with our tyres this afternoon to try to catch Markko but it didn't work out. But I'm not disappointed with fourth, I'm really happy. My previous best result was fifth. Now I've finished fourth, so next it will be a podium! It's been such a hard weekend. I feel much fitter now after spending three days driving in this heat!" Antony Warmbold and Michael Orr re-started this morning after their problems yesterday evening. However, falling oil pressure, the result of the car's oil filter becoming clogged with dirt and sand yesterday, forced them to stop just 10km into the liaison section after the morning service.